The program consists of a volunteer group picking litter off the right-of-way for a section of road which they have adopted. That section of road is around two miles in length. There are to be four pickups between April and November of each year and the contract is for a two year pickup period. A safety training session is held for each group’s coordinators by the Highway Department. The safety vests, garbage bags and marking flags necessary for the pickups are provided to the group, as are the signs which are placed on the right-of-way. These signs indicate the name of the group adopting the section of road as well as containing a warning sign to motorists when a litter pickup is in progress. 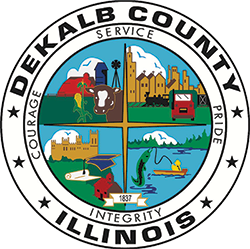 If a group is interested in adopting a section of county highway, they should return the signed agreement along with a list of three county road preferences, indicating the desired length of road they wish to adopt. If there are any questions regarding the Adopt-A-Highway Program for County roads, they may be directed to the County Highway Department at 815-756-9513. The State of Illinois, effective January 1, 1996, is also participating in the Adopt-A-Highway Program. For those parties interested in adopting a portion of State Highway for the program, please contact the Illinois Department of Transportation, District 2 at Dixon, 815-284-5415.